*The above AU$ prices are an indication of our Indian rupee prices (for ease of understanding), calculated at the approx. exchange rate of AUD 1 = INR 53. Write to us for a quote in your preferred currency. 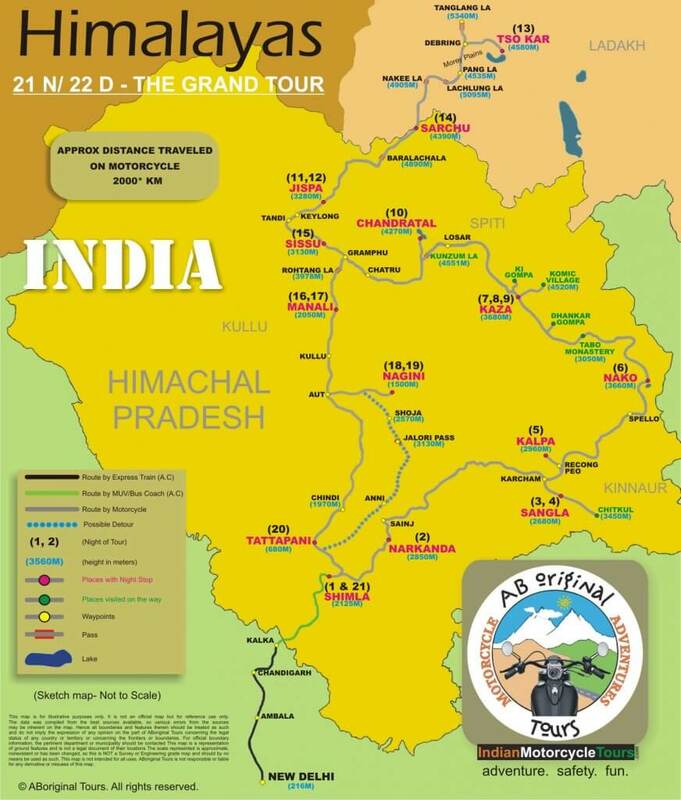 Himalayan Grand-2 is repeat of the Himalayan Grand itinerary (it’s our most popular Himalayan tour). This is how we expect the tour to flow, but as you know…adventure happens! Dive in and get excited! Your adventure begins on the 7am express from New Delhi Railway station.The 4 hour journey will bring you to Kalka (at the foot steps of the Himalayas). A 4 hour bus/coach journey from here will bring you to Shimla (capital of the state of Himachal Pradesh & former “summer capital” of India). Today you’ll meet your Royal Enfield Motorcycle, your ride for the next several days. After an extensive briefing session by your ride leader you’ll take a short ride in an effort to familiarise yourself with the bike and riding conditions. Today’s ride is short but challenging. You’ll be riding up the Hindustan-Tibet Highway (NH-22) towards Rampur. We leave the NH-22 at Narkanda, where a 6km road winds up the mountain to a beautiful “forest lodge” amongst lush greenery. You’ll be at an altitude of about 2850m. Heading further along the NH-22 you’ll continue towards Kinnaur, where you’ll ride alongside the fierce Sutlej as you reach turning point Karchham. 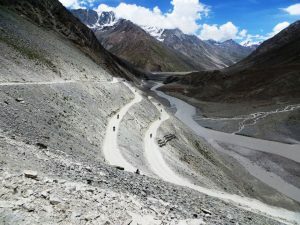 Here, a road continues towards Spiti and another turns towards the Baspa Valley and on to the beautifull village of Sangla. This is another 18km stretch of narrow winding road with hair-raising gorges & cliffs high above the Baspa river gushing below. Accommodation is in a comfortable tent camp at a beautiful setting on the banks of the river. After enjoying a quiet morning in the lap of Sangla valley you’ll saddle-up once again, for a short ride to Chitkul, another quaint village in the Baspa Valley. Chitkul is the last village on this road towards the border with Tibet (China) and offers great views of snow clad peaks of the Kinnaur region. After spending a little time here you’ll return to Sangla in time for lunch. The evening is at your disposal to take a walk along the Baspa river or just enjoy the view & the setting from the camp. We’ll backtrack to the NH-22 at Karchham and continue on the road towards Recong Peo, where you end up in the village of Kalpa. You’ll most likely be spending the day absorbing the stunning views of the “Kinner Kailash” and reminiscing the past few days after you left Shimla. Or perhaps walking around this lovely village & its apple orchards. We, on the other hand, will be busy arranging your Inner-line permits (which are required by “foreign visitors” for visiting the areas ahead) and giving the motorcycles a thorough check-up for the journey ahead. You’ll be heading further up the NH-22 tomorrow and soon enter a region devoid of certain amenities (cell phone networks & provision stores, among other things) so this is your last chance to make long distance phone calls, stack-up on toiletries, or anything else you need. As you ride further up the Hindustan-Tibet highway, the landscape changes from green to rocky & barren. Still riding along the Sutlej you’ll reach Spello where your permits will be checked at a police check-point. Another 35km ride will bring you to Khab, a small village at the confluence of the Spiti & Sutlej rivers. From this point on you’ll be riding along the Spiti river to reach Nako, a village situated near the small but beautiful Nako lake (Altitude 3660m). This is first of the many high altitude lakes visited by you on this tour. The location of this village is remote & infrastructure is basic. Accommodation here, is in a comfortable tent camp. Today’s ride will take you further up into higher mountains (and across the infamous “Maling Nala”, your first major water crossing) then down to Chango where you’ll enter Spiti Valley. Your first destination is Tabo where you visit the historic monastery. 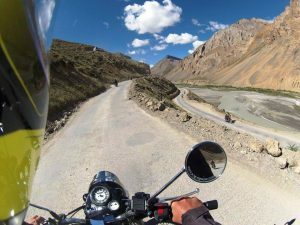 After having lunch at a restaurant nearby you’ll embark on the days second leg, a 47km ride along the Spiti river to Kaza. Kaza is the headquarters of the Spiti sub-division and you’ll be staying here for 3 consecutive nights. You’ll be able to use facilities like Internet & long distance phone calls again, “luxuries” you left behind at Kalpa. This day can be considered a full rest day or can be used to explore the town and surrounds. Today you will be visiting the Key Gompa and Komic village (4275m), considered to be one of the highest villages in Asia, on your motorcycle. Continuing up the Spiti Valley & further into higher Himalayas, today you’ll arrive at the second High Altitude Lake on your tour. After crossing a high pass (Kunzum La, 4550m) and a couple of streams (glacier melts) you’ll reach a pasture land 4km short of the beautiful & desolate lake of Chandra Taal (vehicles are not allowed beyond this point & camping is no longer permitted near the lake shore). Here, the accommodation will be at a “basic” camp-site in “alpine” tents (sleeps two each). Sleeping bags will be provided. Dinner & breakfast will be basic “camping meals”. Calls of nature will have to be answered in a small toilet tents or “in the open”, as per your preference. After breakfast, you’ll say goodbye to the “Moon Lake” and head down into the Lahaul Valley, along the Chandra, a river originating from a glacier near Baralacha La. 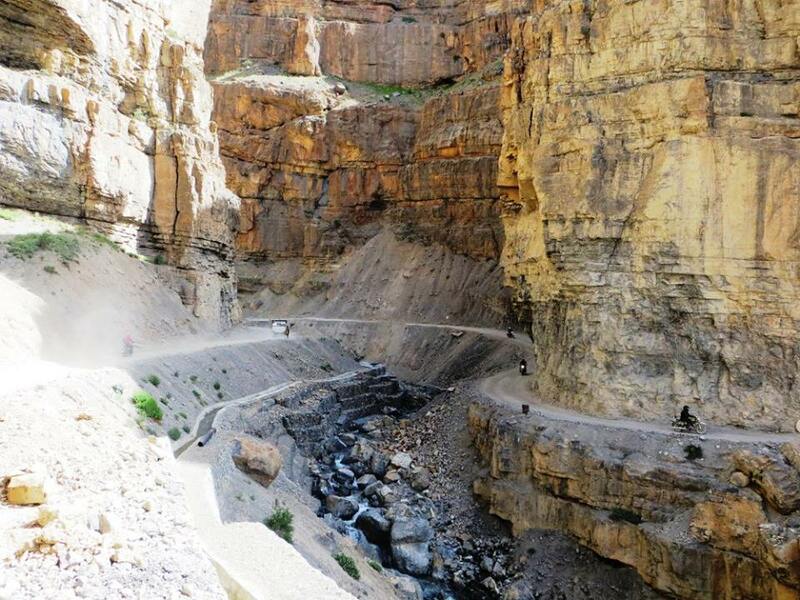 The road (or the lack of it) from Chandra Taal all the way to Gramphu (where it meets the popular Manali-Leh “highway”) offers some of the most thrilling riding experience you’ll have on this tour. This stretch of the journey has several big & small water crossings challenging enough to test your grit & determination. After Gramphu its a relatively smooth ride till Jispa (20km ahead of Keylong). On the way, the Chandra & Bhaga rivers meet at Tandi (which is also the last fuel station before Leh) & together form the Chandrabhaga river which is renamed as “Chenab” in Jammu & Kashmir state. Jispa is small village, mainly serving as a convenient stop-over on the way to Ladakh. A well deserved rest day has been placed here after 2 challenging days of riding, especially because another 3 days of back-to-back riding follows. Here you’ll be able to snuggle in a soft, warm bed once again (and enjoy a hot shower) in a beautiful Guest House right on the banks of Bhaga, a river originating from Suraj Taal (Sun Lake) also near Baralacha La. Once you leave Sarchu it becomes evident that you’re going deeper into the Himalayas and any sights of human settlement will become few & far between from here on, barring some temporary “tent restaurants”, truck stops & Indian Army barracks. 85km from Jispa, Sarchu is the last settlement (& check-point) in Himachal Pradesh. You reach here after crossing over Baralacha La (4930m), one of the many high passes on this tour & considered to get the maximum snowfall during the winters. You’ll also pass Suraj Taal, another of the high altitude lakes in the region. Accommodation is in comfortable tent camps. Crossing “The Morey Plains”, at an average height above 4000m, you’ll cross another two high passes (Nakee La 4905m & Lachlung La 5095m) until you reach Tso Kar (4524m), the third high altitude lake on this tour. Surrounded by a wild life sanctuary, Tso Kar is a salt lake and breeding ground of many rare migratory birds. Accommodation is in comfortable tent camps. Leaving after breakfast, you’ll first climb to the Lachlung Pass. At 5340 M, this is the highest pass you’ll be riding to on the tour. From here you’ll backtrack to Sarchu riding over the high passes again. The views in the opposite direction are equally spectacular and give a new perspective & experience. Riding further south and back-tracking past Jispa, you’ll arrive at a small hamlet of Sissu, on the banks of the Chandra river. The camp here has a spectacular setting and offers the opportunity to take short hikes in the beautiful surroundings. Riding past Gramphu, you leave the Chandra river behind as you ride up to Rohtang La (3978 M). The scenery starts to turn a lot greener as you head down the Rohtang pass to the town of Manali. Situated along the banks of River Beas at the northern end of the Kullu valley, Manali is a popular tourist destination attracting thousands of Indian tourists in the summers who want to beat the heat of the plains (back to civilization). Another day for relaxation, exploration or contemplation depending on your inclination. Heading south from Manali, along the banks of the Beas, today’s ride takes you through some beautiful scenery. Riding down the Kullu valley past Naggar, you’ll leave behind the Beas and turn south-east towards Banjar at Aut. From here, a 28km long path lined with apple orchards leads you to your destination, a small hamlet called Nagini, on the edge of “The Great Himalayan National Park”. Nagini and it’s surrounds offer some interesting experiences including fishing for trout in the Tirthan river, village walks and a short trek to a small but beautiful waterfall. The penultimate days ride is another spectacular journey along the Beas, through the apple orchards of Karsog region, past several picturesque villages down to the village of Tattapani on the banks of river Sutlej. You’ll saddle-up yet again and for the last time on this tour for your journey back to Shimla. The evening can be spent taking a stroll on The Mall and doing some souvenir shopping. A farewell dinner is organized at a popular restaurant in the city. It’s time to say your good-bye’s to fellow travelers & the Himalayas. You’ll be taking a 3-hour Car/MUV ride down the Shivalik range to its footsteps at Kalka from where an Express Train will take you to New Delhi (in about another 4 hours) which shall be the end of the tour. Dinner is served in the train & is inclusive in the fare. If you’ve purchased a “Farewell” add-on you’ll be transferred to the hotel where your accommodation has been arranged. *Distances measured are approximate Odometer readings. Actual / Sat Nav figures can be different. IMPORTANT ADVISORY: Please note that touring in the Himalayas on a motorcycle involves considerable amount of riding on un-paved/dirt track/loose gravel/wet mud type surfaces as well as creek crossings, some of which can range between moderate to difficult. Riders need to have confidence in their riding skills/experience to be able to handle their bikes under such conditions. We would expect that you have at least 3-4 years (10,000 – 15,000 KM) riding experience (& some off road skills) before you consider registering for these tours. Also, since the routes involve being at high altitudes (above 3500 M), a certain level of health/fitness is a pre-requisite. Write to us if you have doubts or need further clarifications. Please note: On all our tours the space on the support vehicles is limited. Hence, we request that you limit your baggage to 25 KG. Our Himalayan tours start and end in New Delhi where the temperature can get up to 42°C in July. Even in the Himalayas the temperature at low altitude can get up to 30°C. However, they can fall below freezing at high altitudes in the mornings and during the nights (0-5°C). Rain is a certainty with snow being a possibility. Please keep in mind that you need to be reasonably fit to participate in tours. IMPORTANT: Applicants are advised against participating in any Himalayan tours if they suffer from severe asthma, muscular disorders, respiratory or heart disorders, or any medical precondition which might be detrimental to the health of the participant on a tour which involves spending nights in high altitudes (3500 to 4500 metres). Please consult a doctor before booking a Himalayan tour. When travelling through India it is advised to carry your own drinking water that has been obtained from a reliable source (RO/UV water filter) or always drink branded mineral/packaged water. Water for drinking, brushing teeth or making ice should first be boiled or otherwise sterilised. Avoid dairy products likely to have been made from unboiled milk. Milk in India is often unpasteurised and should be boiled before consumed. Any fruit and vegetables should be cooked and/or peeled before consuming. To avoid TD or other sickness while travelling include avoiding undercooked foods and street vendors. Popular tourist restaurants and hotels will have clean facilities for you to use. *This is a general guide. Please consult your doctor for country specific medical advice. Mobile phone: Roaming agreements exist with most international mobile phone companies. Coverage is limited to major towns. Internet: Wi-Fi is available in most hotels and cafes. Post: Airmail service to U.S and Western Europe takes up to two weeks. Travelers should apply for a tourist e-visa before they visit India. Processing time is generally between 36-48 hours, you can apply for an e-Visa here. These are single/multiple entry visa’s that are valid for a 30/60-day stay. To see if you are eligible for a tourist e-visa visit this website. Your adventure starts now! Complete the form below and we’ll be in touch. We’ll get back to you within a couple of days with a registration form. This is to make sure you are, in fact, able to tour (eg: Healthy with an adventurous streak!). Once you’ve returned the completed registration form we’ll send you an email with the price of your tour and a full list of T’s & C’s. To pay for your tour, we only accept Bank telegraphic (wire) transfer. It’s our preferred option because it’s safe, transparent & cheap. While it may seem like outdated technology where you’re from, it’s still standard business practice here. Transfer of funds takes place from your bank account directly to our bank account (with reasonable commissions or charges levied by the banks). Our T’s & C’s document details more info about our payment policy, but if you’ve got questions about ‘wiring’ money please don’t hesitate to contact us or your bank. We’ll send you an email with confirmation, a receipt, and everything else you need to know – so you can get ready for new experiences, with new friends, in foreign lands! The open road beckons. See you at the airport. Booking shall be subject to availability & eligibility. Your booking is confirmed after deposit is received as per the terms & conditions. Your privacy is protected and we agree not to share the information provided with third parties for any purpose, commercial or otherwise, unless legally required. The price of the tour is per person on the basis of twin-share accommodation. “Twin Share” means sharing a “double bed” or a “twin bed” room with your companion, or another member of the tour of the same gender. If you don’t want to share a room you can purchase a single accommodation add-on. Single Accommodation is subject to availability. On the Himalayan Tours, it cannot be guaranteed at locations where we stay in “tented camps” as the availability of such accommodation is scarce during the high season. We reserve the right to impose a “single accommodation” price on a participant, like a minor participant or an unaccompanied participant, if he/she cannot be accommodated with another member of the tour due to any reason(s). To participate as a rider an individual has to be an adult above the age of 18 years at the time of the tour, holding a valid full motorcycle driving license authorizing him/her to ride a 500cc motorcycle and in sufficiently good health to undertake a motorcycle journey without any pre-existing medical condition(s) which may be detrimental to the participants health & safety. To participate as a co-rider on the pillion an individual has to be above the age of 12 years. Further details will be available for your perusal in the terms & conditions appended to the tour registration form. Take a look at our other tours in this region! Spend 3 whole weeks in the Himalayas testing exactly what you’re made of. You’ll be a different person after this one. A 2 week circuit around the remarkable Spiti Valley, one of the Himalaya’s most challenging regions. Copyright © 2019 Indian Motorcycle Tours. All Rights Reserved.